A friend, Joan, came out to sew the other day. I was supposed to be helping her, but we kept calculating wrong, and ended up with little brown and white triangles that were the wrong size. Joan left them for me ‘to make a dolls quilt’ so I did! 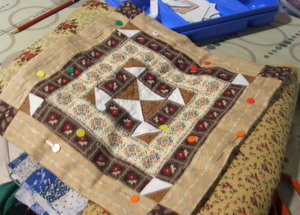 it measures 11 inches, and I’m hand quilting it.